Imagine today having in your hangar (or garage) your very own ultralight airplane kit which you received yesterday via courier. Although you hardly slept at all you throw down breakfast as fast as you can and then lock yourself away so that you can study the kit plans for your ultralight airplane. Once you have completely read through your airplane plans you return to the front page again although this time your tool kit is nearby and you are ready to commence at step one of page one. HANDY HINT: Prior to opening your ultralight airplane kit make sure you put down a white drop sheet so that when you drop a screw or clip or any other part it will be easy to locate and won't roll away. After checking that you have received all the parts required in your kit you commence. This usually means you set all the pieces out on the (cleaned) floor for the portion of the airplane you are about to build. With the frame all built your ultralight aircraft kit is starting to take shape. Moving on to the wing frames your going to need plenty of room as wings can be up to 10 metres long. Not only do you assemble the frame work you also need to cover them. So make sure there is plenty of room to move around. Of course the wings can be assembled outside however do not forget the tip about the drop sheet. Frame is all built and both wings assembled and no parts missing or unaccounted for - WELL DONE. Basically speaking all that there is left in your airplane kit is the engine and the controls for your ultralight aircraft. You have built your kit this far and probably feeling reasonably confident. Now it's time for the engine and all the controls before the final inspection - you are going to fly your ultralight airplane - right? Just reminding you how important it is to get it all right. Now is not the time to speed up or take shortcuts. Many a mechanic knows that mistakes are usually made at the beginning of a project or near the end and it is all due to excitement. So stay steady. The immense pleasure you are about to enjoy from your ultralight airplane kit is threefold. Firstly you purchased your very own ultralight airplane in kit form. Secondly you carefully assembled the kit to completion and thirdly - your ultralight aircraft actually flies!! Now let's make it all happen for real. 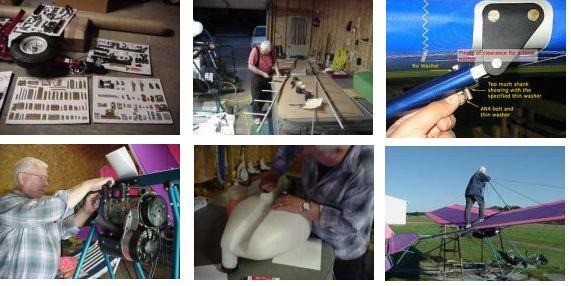 You can purchase your ultralight airplane kit right here. You might not have the ability to build ultralight aircraft kits. Hey that's no problem. Go ahead and purchase the ultralight you desire and have it built for you. There are many ultralight manufacturers that (for an extra sum of money) will build your aircraft for you prior to delivery. This means that you still get to enjoy the pleasure of flying for a very cheap price. That is only the start of the enjoyment of ultralight airplanes. Needing some more information on ultralight kits? Good. Not only are there airplane kits I also have helicopter kits for you to continue researching and purchasing if that is more what you are looking for. These amazing ultralight helicopters range from the very simple open aircraft to the more typical closed cockpit design. Head right over to Ultralight Helicopters by clicking here.